I love Mother's Day. Being a mother is the most important part of who I am! I owe so much to my incredible Mother... She taught me everything I know. I love daisies. 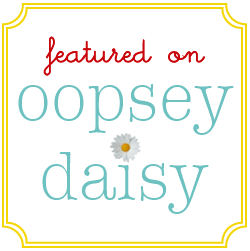 The name of my blog is no accident. 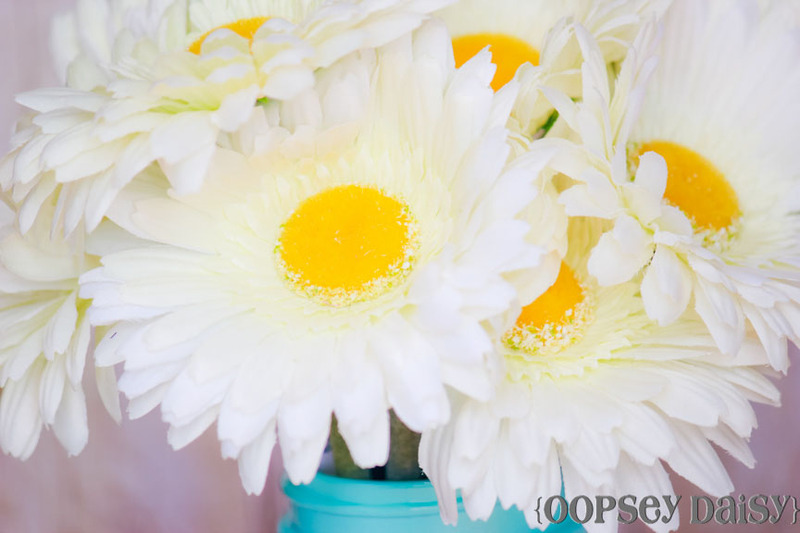 Daisies equal happiness for me! 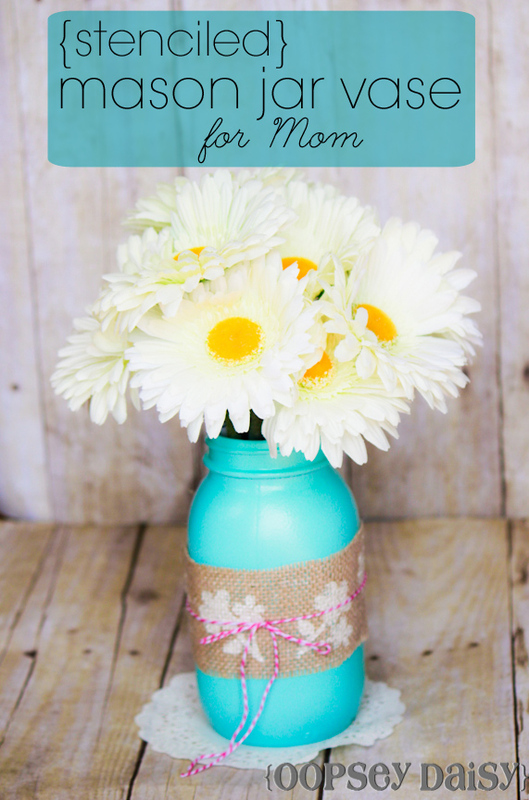 I thought these would be the perfect way to express our appreciation for my Mom, a true flower enthusiast! 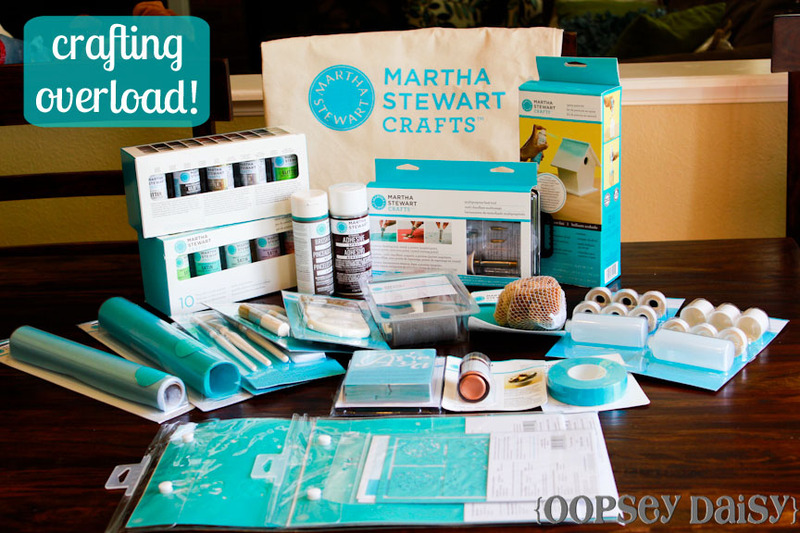 It was like Christmas morning when I ripped open this package of amazing supplies from Plaid's Martha Stewart's craft line. Talk about creative inspiration in a box! There was acrylic paint, glitter, all sorts of stencils, a heating tool, a spray painting kit, every kind of brush I could imagine, a sweet tote bag, and all sorts of stenciling accessories packed inside. I even created a "haul video" showing the entire crafting stash as I opened the box. ** For the record, I set up the tripod and taped myself while mr. oopsey was out of town. I felt a bit awkward! I'm still new to vlogging, but if you want a tiny sneak peek of the new house, maybe focus on the background instead of me! Ha! 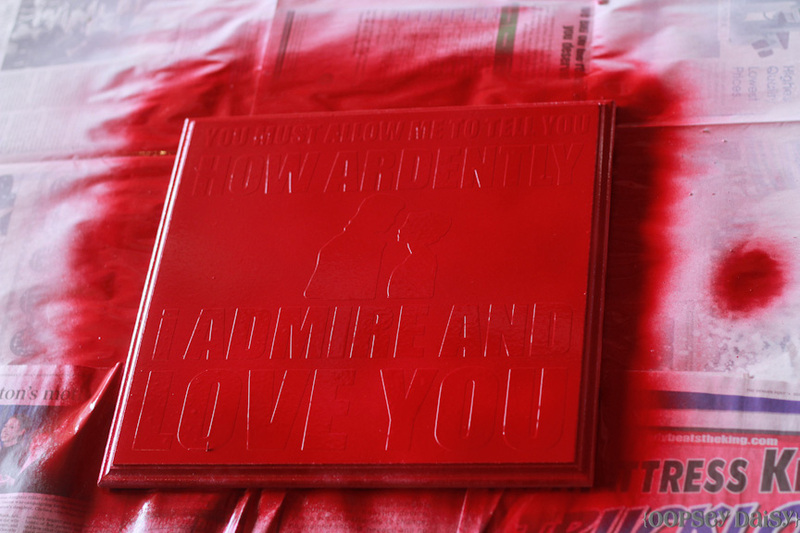 For this particular project, I wanted to try out the spray painting kit. Hello! 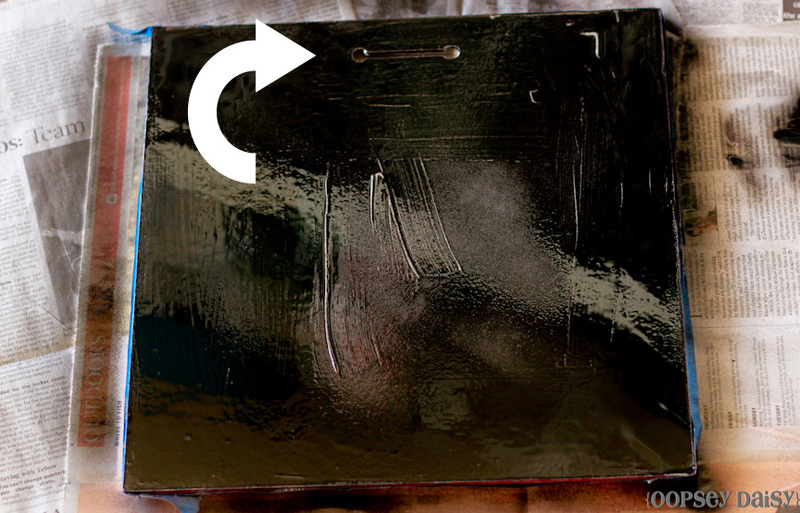 Turning acrylic paint into spray paint just sounds fun. So I gave it a shot! This was shockingly easy! I carefully followed the directions on the sprayer kit to mix the correct proportions of the gloss spray medium with acrylic paint. 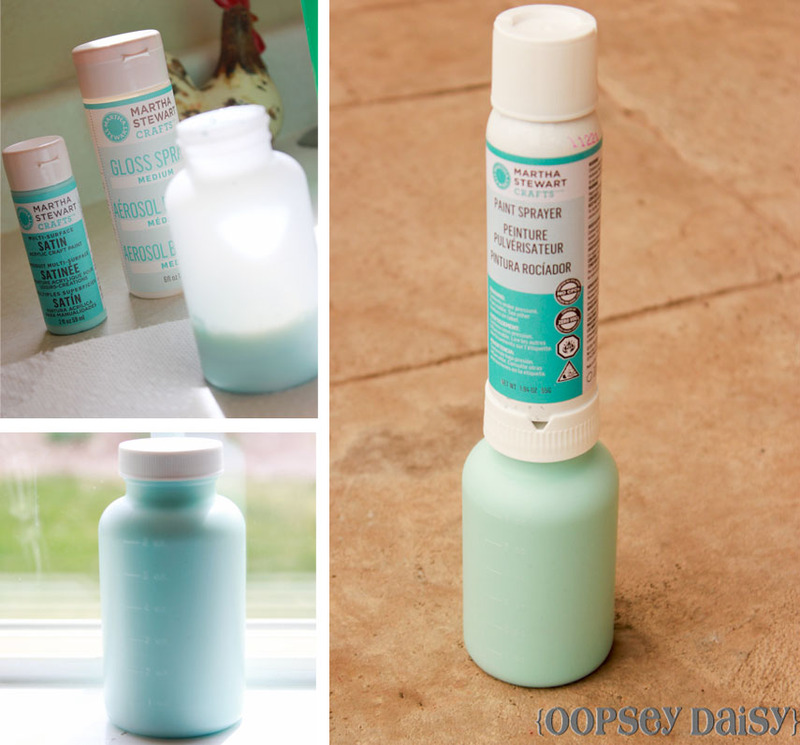 Then I simply twisted the sprayer onto the bottle. Easy, right? 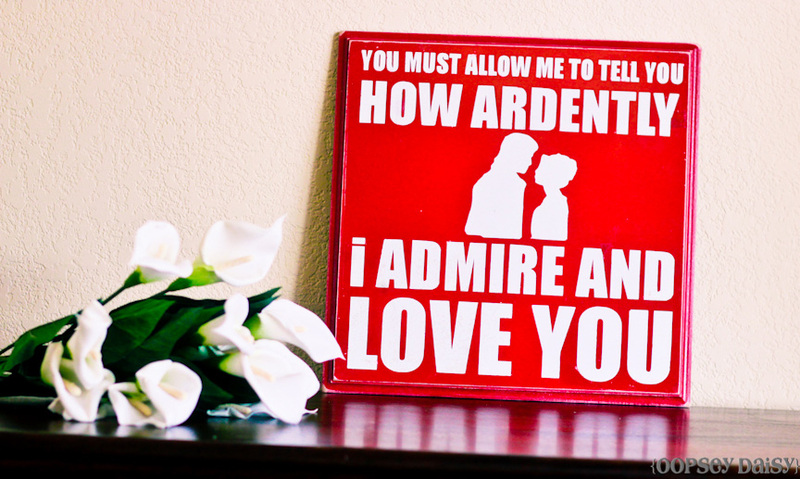 If you are not a Pride and Prejudice fan, I apologize. This makes two back-to-back P&P crafts. 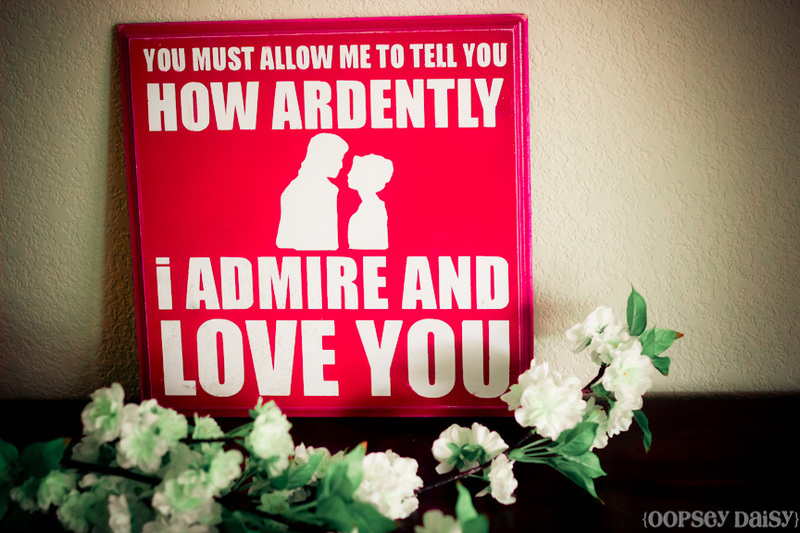 But Pride and Prejudice makes me think of classic romance which is perfect for Valentine's Day! It brings to mind slumber parties with my sisters in our pajamas. I have one sister in particular who will most likely have a Pride and Prejudice-themed wedding someday. We love it that much. I dug through my stash of unfinished wood and found this 12x12 board--with beveled edges as an added bonus! It wasn't exactly spray painting weather, but we made do. I gave it a base coat of white. I designed these two quotes in Photoshop. Don't you love the silhouette of Elizabeth and Mr. Darcy?! It's my favorite part! 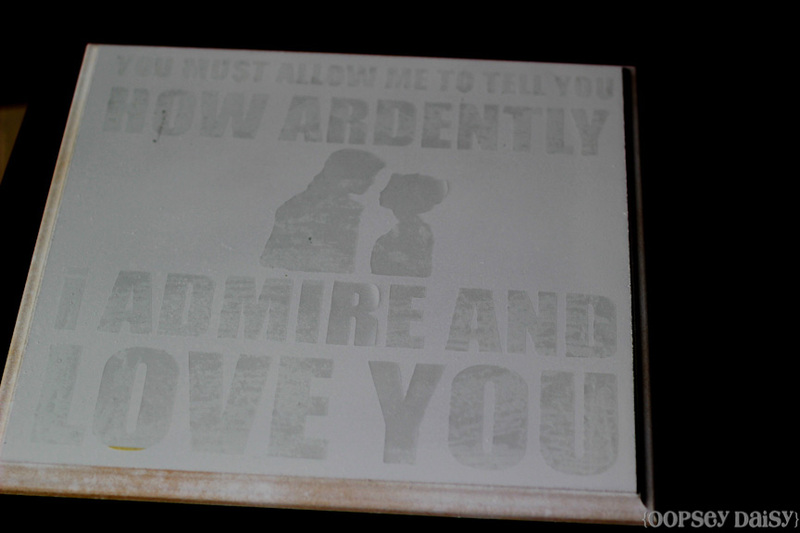 I firmly believe that contact paper makes the best stencils. 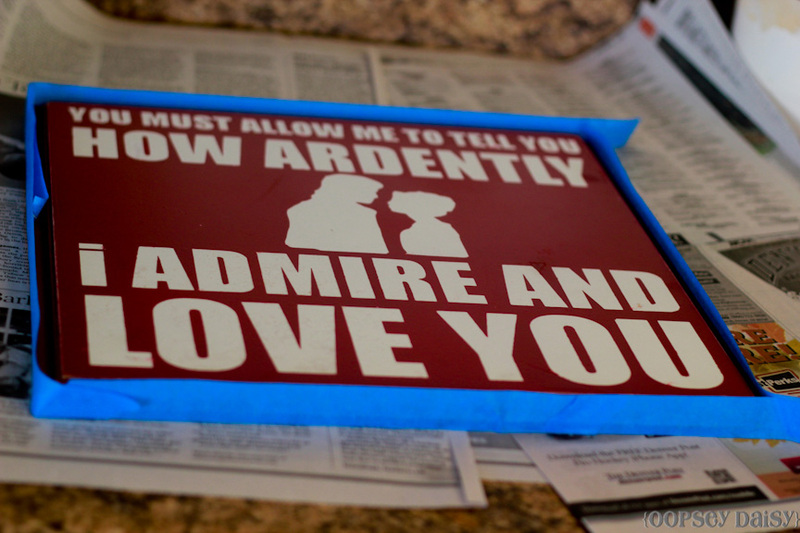 So I cut out the first quote from contact paper using my Cricut. I made the mistake of buying clear contact paper. Man alive, this took some serious concentration to cut out my stencil, transfer it with transfer paper, and apply to my board without missing a dot of an "i." 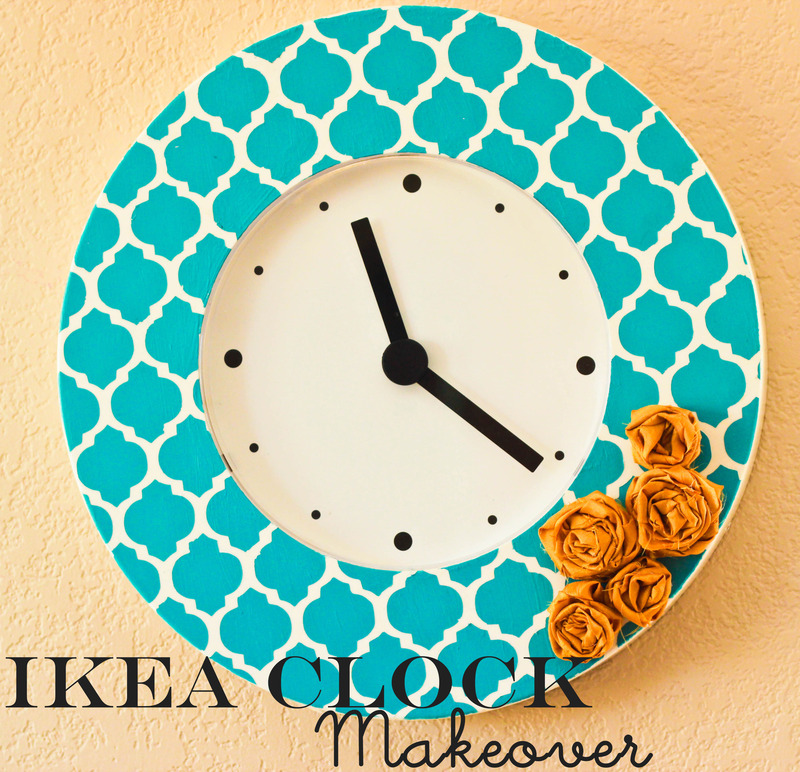 I will be headed back to the store to get white contact paper ASAP! Then I spray painted the board red. This way the letters would stay white. 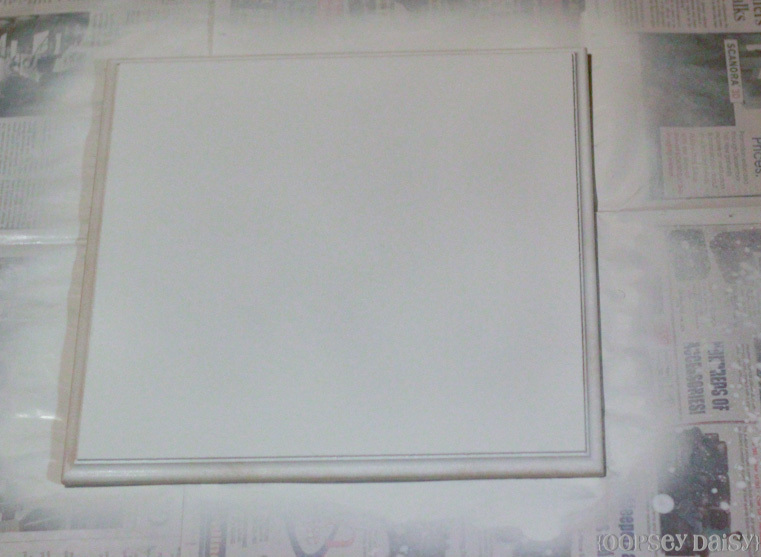 I applied white vinyl to scrapbook paper, and modpodged it onto the back side of the board. I seriously LOVE how this turned out! 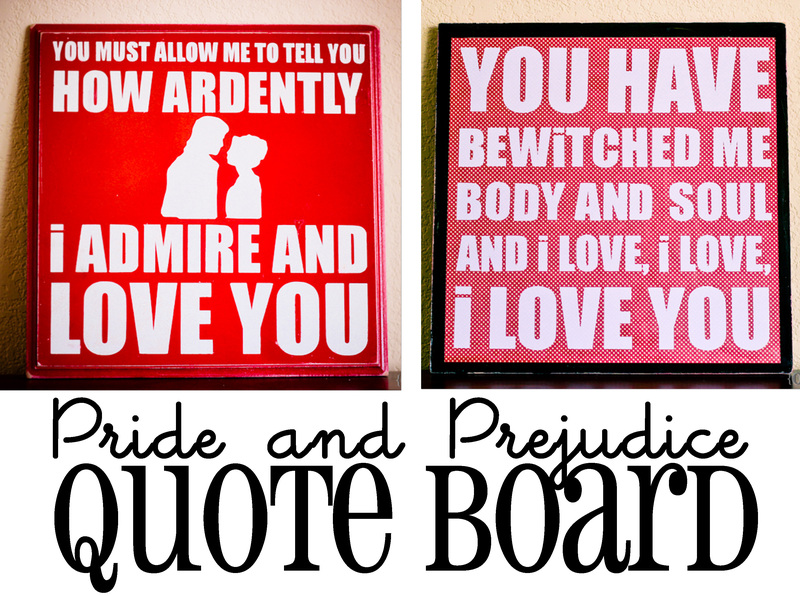 And I love the versatility of flipping the board over and having a whole new quote! 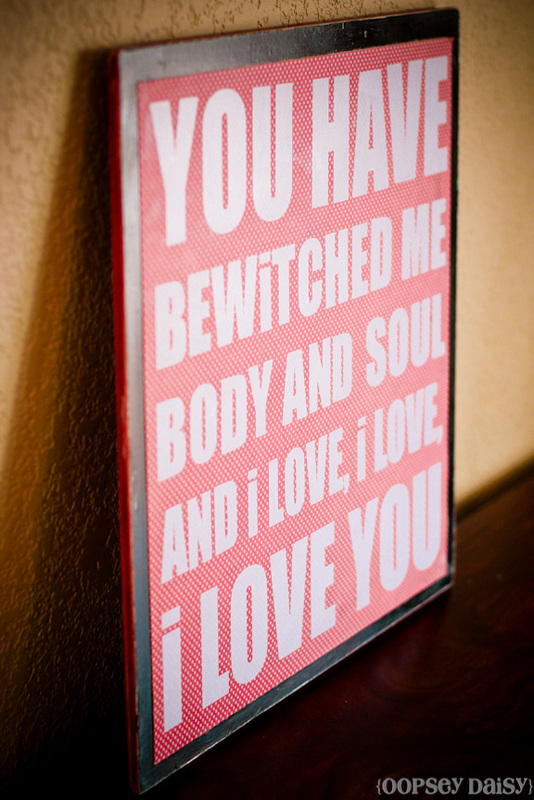 Now for tonight: I plan to snuggle up on the couch and have a date with Mr. Darcy! 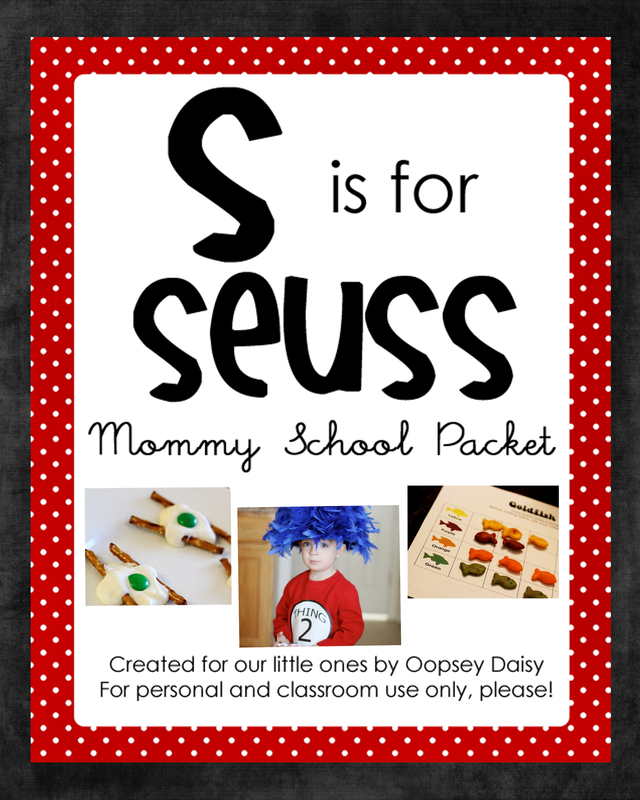 Linking up to Tidy Mom and these great parties. Right now at this very moment, our family is enjoying Disneyland!! 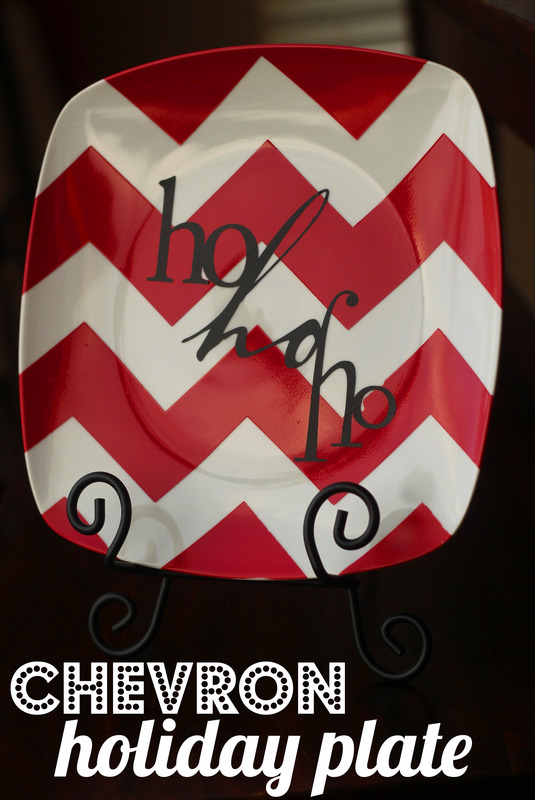 In the mean time, I thought I would share the full tutorial for my chevron spray painted holiday plate! I think Santa would be proud! I added a little spray paint, a little chevron, and a little ho-ho-ho! 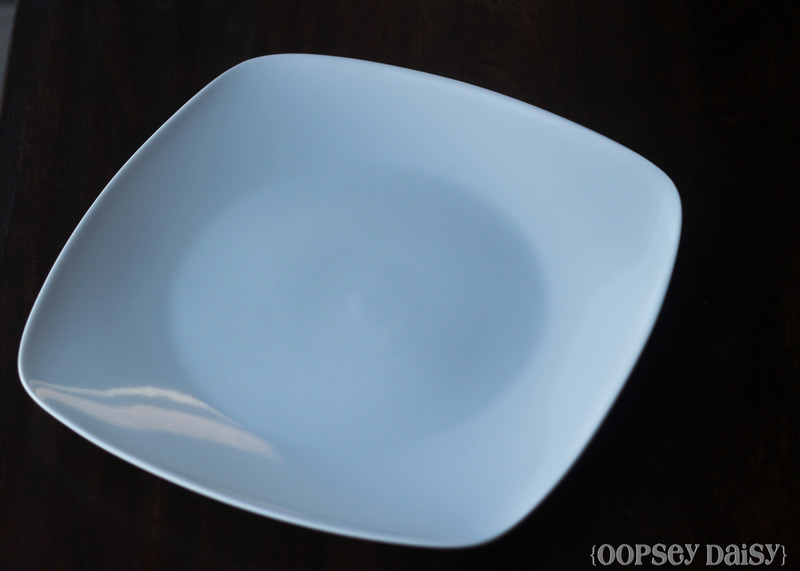 I started with an extra plate I had at home. Nothing too fancy. There are only 37 days until Christmas! I can hardly wait. Who wants to join me for some hot cocoa?? Rather than becoming overwhelmed by the hustle and bustle of the holidays, I want to focus on the true joy of the Christmas season. What better reminder of true joy than a picture of the people I love most?! 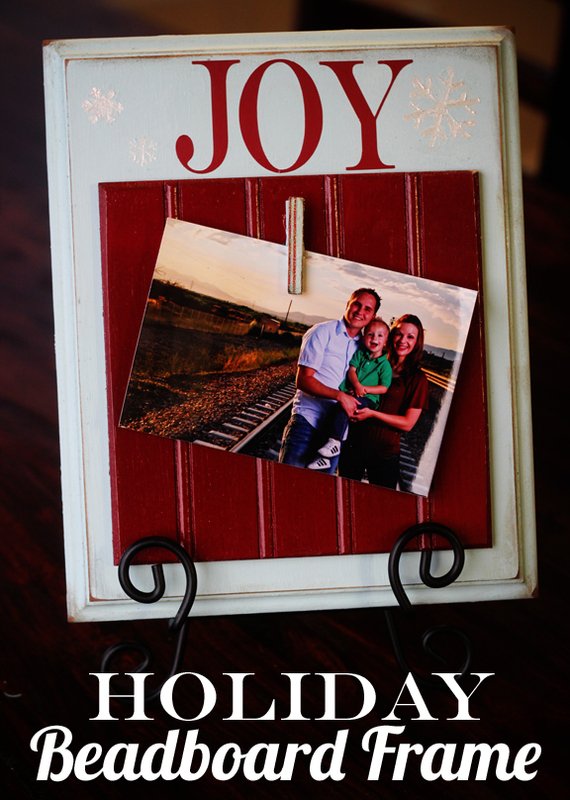 I thought it would be fun to display our latest Christmas card or family photo on this faux frame. I was thrilled to try out some of these amazing goodies! I was very impressed with Martha Stewart's new paint line. I tried out several craft paints, glitter paint (best invention ever! 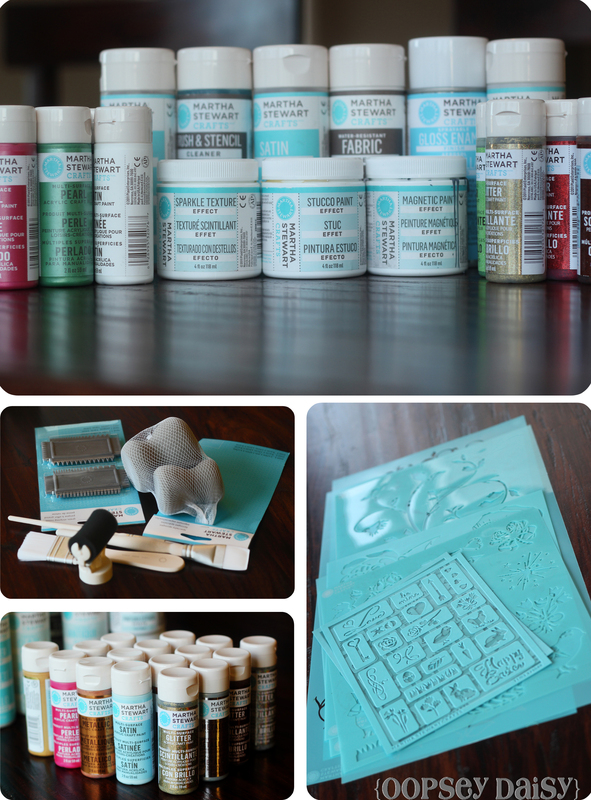 ), some gorgeous stencils, brushes, sponges, etc. 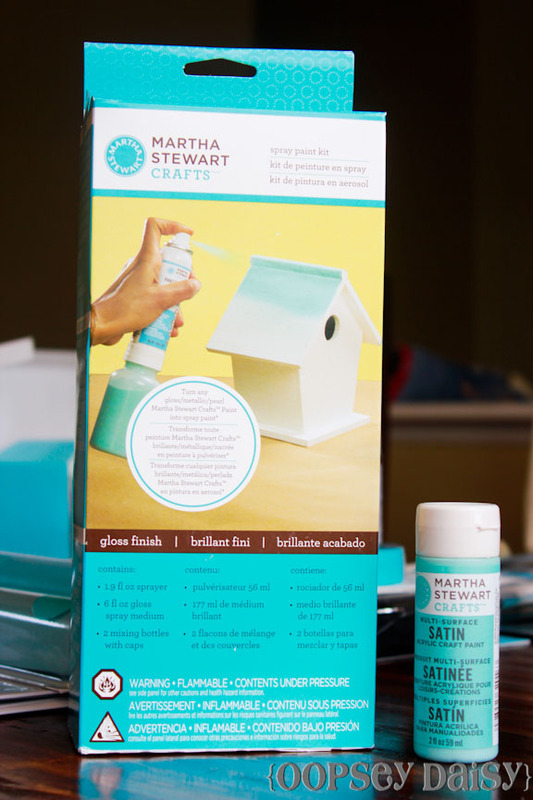 I love that Martha's new craft paints are multi-surface. They are intended for everything from fabric to glass! This is the best part about blogging. Hands down. Meeting other creative minds and creating friendships. 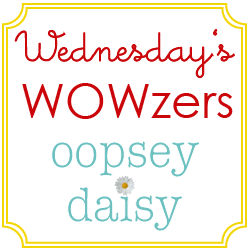 Did you know that for a VERY long time I threw myself little pity parties because I truly believed that I was the one and only craft blogger from Colorado? Well no more excuses. 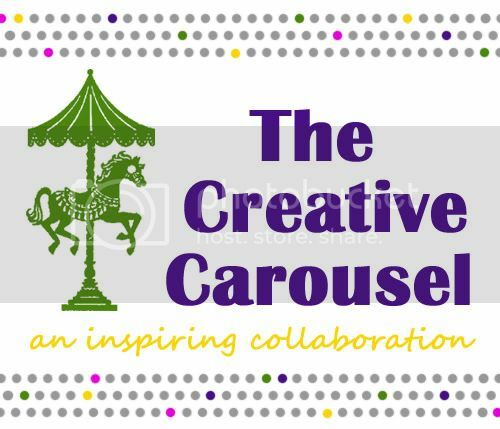 I have finally met some creative minds (and fabulous friends!) that live in my same state. A few weeks ago, I got to meet them all in real life at Colorado's brand new Ikea store. These sweet ladies put up with me bringing along my toddler. 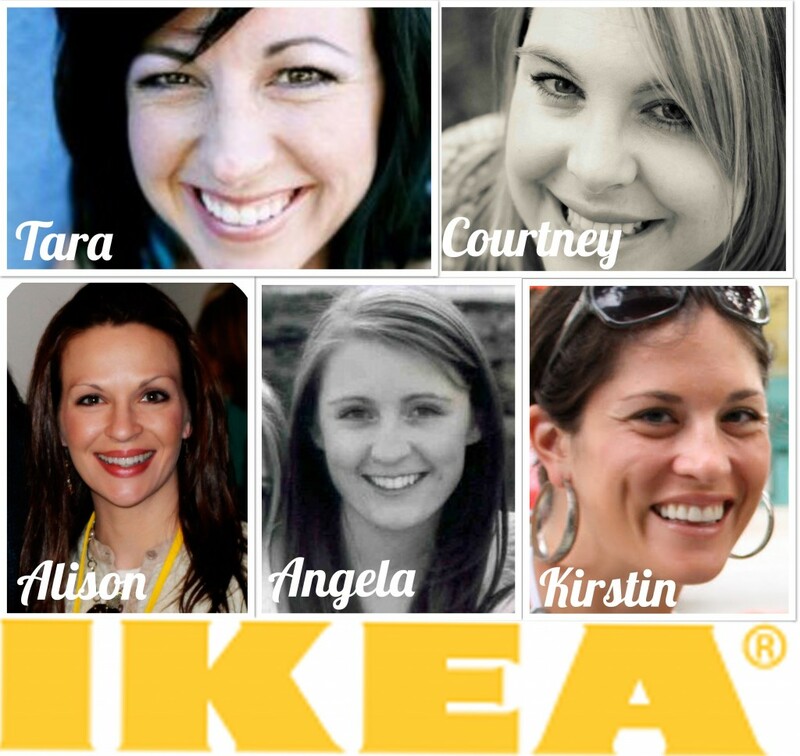 We munched on meatballs and talked blogging. To think that someone else in the same state can relate to me is amazing! These gals are incredible. Love them, love them, love them! So as we strolled the aisles we decided to take on a challenge. Together. 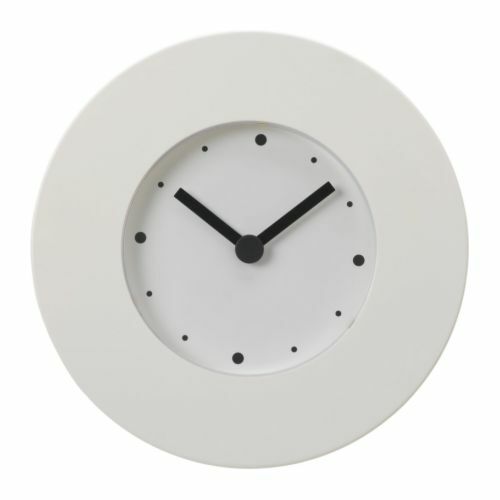 Here is my own little contribution to the Ikea Clock challenge! But let me back up a little bit here.